The Atkinson Commons, a 6-unit residential development in the rapidly growing outer Division neighborhood, is complete and now leasing. The white stack bonded brick contrasts with traditional black iron spot running bond brick bookending each end of the two buildings. Bracketed in-between the brick are large window bays framed by sustainably-harvested natural Oregon wood. Stained wood also accents the recessed balconies on each unit, giving the residents a mix of true outdoor and vibrant indoor spaces. Divided between the buildings, the project offers 1, 2, and 3-bedroom units, each with a unique floor plan and identity. 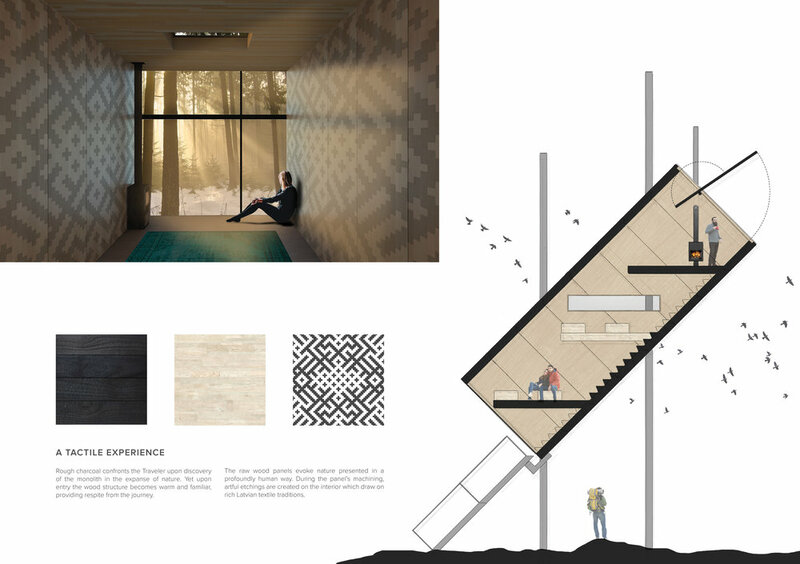 As a firm, Dominek Architecture entered the 2017 Amber Road Trekking Cabin Competition put on by Beebreeders. 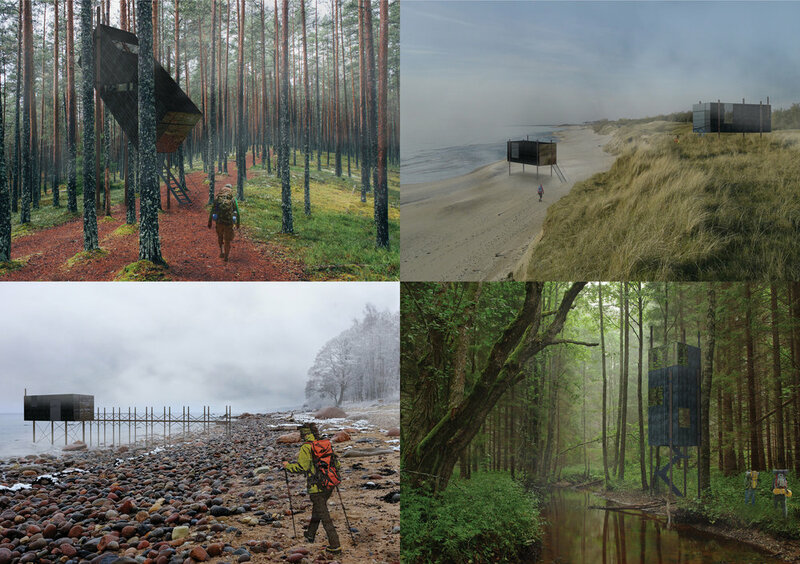 The competition invited design teams to investigate and develop a short-term use cabin for the future Amber Road Trail, which will travel along the coast of Latvia. The mild climate, not dissimilar from the Oregon coast, sandstone beaches, and aspen forests provided a unique opportunity to develop a design language that was both intriguing and respectful of the natural setting. Inspired in part by recent viewings of 2001: A Space Odyssey in 70mm at the Hollywood Theatre, our team developed a prototypical cross-laminated timber (CLT) "box" which could be oriented and arranged throughout the various sites in unique and interesting ways, engaging with the different terrain in sometimes surprising fashion. The way these monoliths would appear in the landscape in the traveler would inspire curiosity and delight. Outside the CLT was treated with Shou-Sugi-Ban charring while inside, a delicate pattern of traditional Latvian symbols was etched into the wood; a wonderful tactile experience both inside and out. 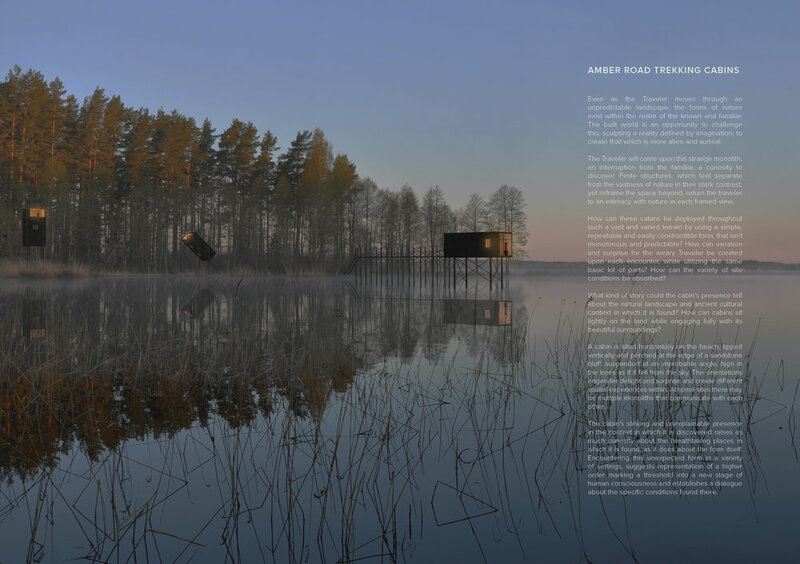 Frameless windows of highly reflective black glass accentuated the seamless look of the cabin and framed the views of the Latvian landscape for the occupants. Below are the final competition boards. Dominek Architecture brings a sustainable building practice point of view to our work. We love working with clients to responsibly plan and build the future. We're proud to announce that the Krissu Condominiums have received LEED Gold Certification by the USGBC. The 6-unit condominium project in Lake Oswego, Oregon was designed with LEED in mind from the schematic phase onward. Working tightly with the Contractor and project Consultants, the project included practical and unobtrusive strategies which resulted in a high performance building and site. Below is a summary of the point totals for the LEED for Homes Gold certification. More information is available via the Green Building Information Gateway at www.GBCI.org. Innovation and Design Process - 4.5 pts. Location and Linkages - 10 pts. Sustainable Sites - 19.5 pts. Water Efficiency - 8 pts. Energy and Atmosphere - 22 pts. Materials and Resources - 6 pts. Indoor Environmental Quality - 13 pts. Dominek Architecture partnered with D&B Group to revitalize and renovate the Foss Maritime Center, located on the bank of the Willamette River. The design of the Center focused on the modern needs of full time, 24 hour on-call global monitoring staff. With a fleet of over 100 vessels operating globally, the center provides fleet safety and situational awareness for Mariners well ahead of potential hazards including heavy weather, earthquakes, and tsunamis. Exterior improvements focused on the entry lobby, including a new canopy, elevator, and custom metal cladding. The Interior features a new fleet monitoring center with a 20’ x 5’ video wall and a large training center. The project included an extensive environmental permitting process, which drove the planting of over 400 native plants to enhance and restore the riparian edge in this heavy-industrial zone. Prism Health Clinic, located on SE Belmont Street, is the State of Oregon's first LGBTQ+ dedicated clinic. Dominek Architecture is truly proud to have partnered with Prism Health and Cascade AIDS Project to bring this first of its kind clinic to Portland. Rich materials and local art are used to soften and warm the cool structure of the spaces, and provide a unique and inviting experience. These images showcase the reception and waiting areas, the family meeting room, as well as the custom casework in the clinic rooms. Please visit www.prismhealth.org for additional information. The clinic is now open and accepting new patients. To serve Portland's southwest student, commuter and resident communities, Green Zebra Grocery has expanded to Portland State University’s campus in downtown. Located on SE Broadway and Mill Street, the new grocery store will serve the student population with fresh and local offerings right in the campus’s urban backyard. Dominek Architecture led a multidiscipline team of retail designers and contractors to complete the extensive remodel of the ground floor retail space in a 1960’s concrete parking garage. Exposed waffle slab ceiling and reused concrete floors give the space a unique, industrial, and unobtrusive feel, letting the merchandise and the students’ shopping experience stand out. Visit http://www.greenzebragrocery.com/ for store location and hours. 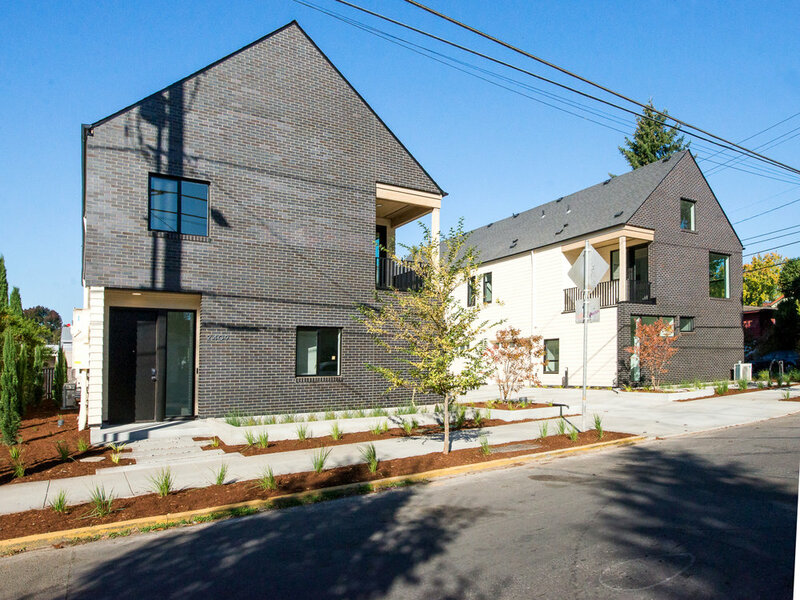 Situated adjacent to the Pittman Addition Hydro-park and the active industrial and commercial N Interstate Ave. corridor, Overlook 8 is a new 8-unit, 4-story apartment development in the up-and-coming Overlook Neighborhood in North Portland. The massing of the fraternal-twin structures is designed to transition from the highly developed Interstate corridor to the adjacent residential neighborhood. Eco-roofs, permeable pavers, and planter swales feature prominently, reducing the overall impact of the development. Each unit has a fourth-floor bonus room and roof deck. All images by TRW Images. Prism Health Clinic Grand Opening! Dominek Architecture is proud to partner with Cascade AIDS Project (CAP) to deliver Prism Health, a new LGBTQ-focused health center offering a safe, affirming, and welcoming space where the lesbian, gay, bisexual, transgender, and queer community can obtain compassionate and culturally effective health care. Working within the constraints of an existing one-story concrete building, the clinic was designed to create the most useful and comfortable spaces possible. In addition to all new finishes, a full seismic upgrade was installed. The new health center is located at 2236 SE Belmont Street in Portland, Oregon. Gresham Downtown Dental Group Medical Office Building is Gresham, Oregon has won Silver in the 2016 Qualified Remodeler Awards for remodel projects. This conversion and addition to a vacant restaurant created a modern dental office building and provided the opportunity to set the bar high for this developing stretch of NW Burnside St. in Gresham. Partnering with Emmett Phair construction, we designed the building shell for two new tenants. The design review has been submitted for this new 16,000 SF, 2-story medical office building located in Camas, WA. Our inspiration for the roof is taken from typical gable and sawtooth roof forms, marching them around the building, broken only at the main entrance. The saw-tooth elements provide opportunity for clerestory windows to allow more natural light to filter into the space while creating dramatic spaces within. Bringing the building down to a more human scale, the façade is divided into equal bays on each side with the materiality alternating between vertical charred ship-lap siding and grey brick in a running bond pattern. The juxtaposition of these two materials is brought together through the mutual use of fire in their creation; fire and clay. Framing and sheathing is nearly complete and has revealed the project's exceptional facade proportions and patterning. Preparation work has begun on the rainscreen cladding system with final finishes going on in the upcoming months, including natural wood and Hardie Artisan siding. The prep work for the small green roofs which will highlight the roof deck of each unit will also begin soon, with the final pre-grown plants to be installed towards the end of the project. This adaptive reuse of an existing parking structure will be Green Zebra Grocery's newest location found in the heart of PSU's campus at the corner of SW Broadway and Mill St. Dominek Architecture is excited for the opportunity to work with the Green Zebra and B&G Builders Inc. team on such a unique project.